Disfiguration involves a distinctive process whereby the body in performance, or an existing artwork, may be subject to an intervention which intentionally overhauls, distorts or betrays it; disfiguration may ‘twist’ the original work, to use the term of the artist Richard Hawkins. The body may also inflict its own disfigurations, and display or project them in performance. 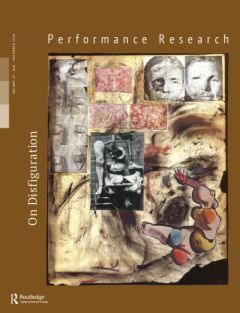 This issue opens up ground for original explorations and interrogations of disfiguration as an idea, procedure or entity with an often-intimate and beguiling approach to performance. Disfiguration resonates with seminal bodies of performance work such as those of Antonin Artaud, Tatsumi Hijikata and Ko Murobushi, but also forms a vitally aberrant strand in contemporary performance, including its digital art dimensions. Research into disfiguration may explore the work of theorists such as Bataille, but also entails the formulation of new kinds of corporeal analysis. 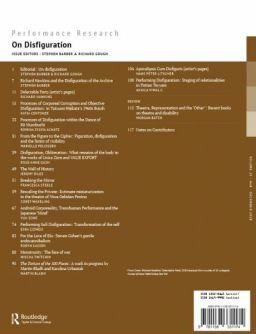 The essays and artists’ pages in this issue engage with preoccupations with disfiguration in multiple and often-contrary ways. In all of its manifestations, disfiguration marks a transmutation in the status of the body which performances envision, archive, excavate or sound.